Dream pop can tend to be a tricky genre. The hazy aesthetic and tranquil moods can grow to become almost too familiar and because of this, as a band, separating yourself from others in the same boat is anything but a simple thing to do. Luckily, for us music lovers there are groups like Portland’s Pure Bathing Culture to give us a taste of something a bit different. Comprised of Sarah Versprille and Daniel Hindman, the duo has only been around for a little more than a year but even still, they’ve drawn comparisons to the likes of Beach House and even Fleetwood Mac and that in itself says a lot. After hearing their debut, Moon Tides, it’s easy to see where these comparisons stem from but the good thing about PBC is that they’re not afraid to embrace similarities while still showcasing what makes them stand on their own as newcomers. Tracks like “Pendulum”, “Scotty”, and “Golden Girl” are where Moon Tides really shines and finds its home nestled between rich soundscapes and gossamer vocals, while the rest of the album follows in blissful footsteps and works to melt within the listener’s ears. 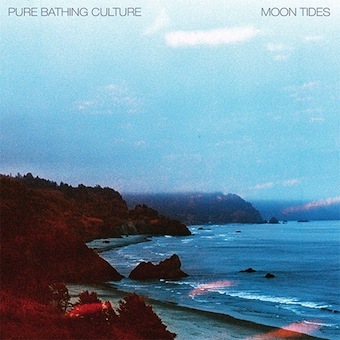 Pure Bathing Culture clearly has a lot to offer and Moon Tides is proof of that but after a few repeats the trance can begin to wear off and leave fans wishing there was more to be found. Regardless, PBC definitely has their place within dream pop and this album is a great place to start.